Synopsis: Last week, the Tahoe basin was blessed with an early season storm that 2-3 feet of powder along the upper reaches of the Sierra Crest. 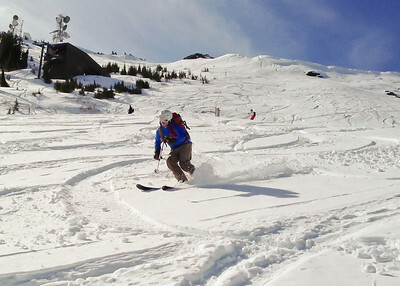 Therefore, Alex, Andrew and I headed up to Alpine Meadows for some early season skinning and skiing. In the afternoon once the weather got too warm and the snow conditions too sticky, we got in some good practice on our avalanche rescue scenarios in a mock debris field we created near the base of the mountain. Generally, I tend to shy away from early season skiing in the backcountry as I get concerned about thin coverage and getting hurt. Alpine Meadows seemed like a good bet on both coverage and being familiar with the underlined terrain if we stayed closed to historically groomed areas. Although it was definitely pre-season conditions and AM is not yet open for about month – so we took it easy.